A new watchdog group in Colorado has filed an ethics complaint alleging that Governor John Hickenlooper (D.,) has made numerous trips in the last 7 years on private planes owned by wealthy allies and corporations, and argues those flights amounted to gifts prohibited state law. An amendment passed by voters in 2006 banned gifts over $50 for elected officials, an amount which has since been indexed up by inflation to $59, according to the Denver Post, which first reported on the issue. 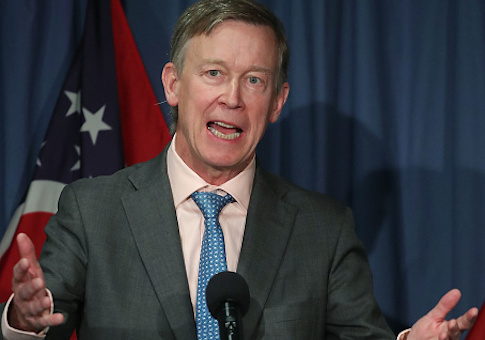 The complaint alleges the flights were easily worth hundreds or thousands of dollars, so Hickenlooper would have needed to pay from his own personal accounts. Under some circumstances, accepting flights could be allowed but would have to be disclosed. The watchdog group Public Trust Institute is also saying the travel they've examined hasn't been included in any disclosure filed by Hickenlooper, which could then also be further violations of the state's ethics laws. "Specifically, Governor Hickenlooper has repeatedly traveled on private airplanes owned by corporations and accepted travel expenses paid for by corporations, each instance represents a direct violation of the Colorado Constitution, Colorado statutes, and this Commission's clear precedent restricting travel expenses for covered state officials," reads a part of the 189-page document from PTI. "These are not isolated or inadvertent violations of Amendment 41 but, as evidenced in this Complaint, are part of a pattern of illegal conduct repeated throughout Governor Hickenlooper's term in office," it concludes. PTI's website lists its executive director as Frank McNulty, a former Republican speaker of the Colorado House of Representatives. The allegations come less than one month after the governor took his most significant step towards a possible 2020 presidential run by forming a leadership PAC, which would, among other things, help pay for or defray the costs of travel to political events or fundraisers and other such events. "It looks like the organization was created in the last few days to trump up frivolous accusations," said Jacque Montgomery, a spokeswoman for the governor. "They ignored the Independent Ethics Commission process by going straight to the media. This is clearly a political stunt aimed at influencing the upcoming election." The complaint goes beyond air travel as well, alleging hotel stays and limousine rides noted in media reports or online videos could amount to additional violations, all of which would be investigated by Colorado's Independent Ethics Commission. McNulty said the governor has an obligation to prove he paid for these travels from his own funds. "If he did, then show us," McNulty was quoted as saying by the Post. "Every elected official in the Capitol has to abide by the same rules; not a single one of them is above the law." Update 10:15 a.m.: This post has been updated with comment from a spokesman for Gov. Hickenlooper.